Something broke in the gears of financial engineering! Companies are still borrowing and spending billions on buying back their own shares – one of the big drivers behind the blistering stock market rally of the past few years. It worked wonderfully and without fail. 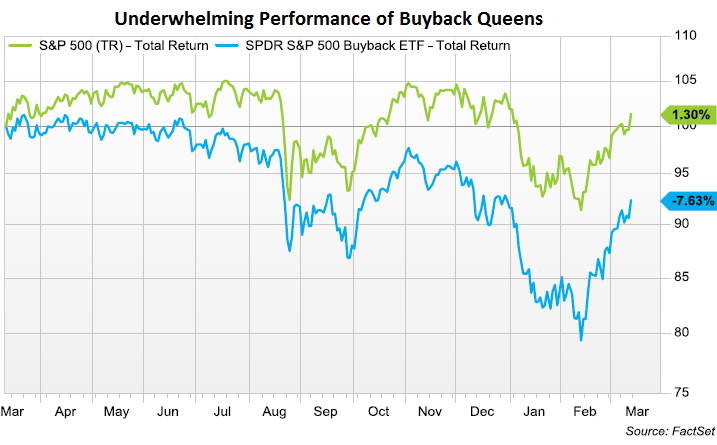 But suddenly, it’s doing the opposite, and now the shares of the biggest buyback queens are getting hammered. Something broke in the gears of this financially engineered market! That’s an enormous amount of corporate cash that was dumped on the market! The sector that blew – “blew” because that’s how it turned out – the most money on this type of financial engineering project was Information Technology, with $33.2 billion in buybacks last quarter. Four of the top 10 buyback queens were Information Technology: Apple, Microsoft, Oracle, and Visa. Apple alone blew $6 billion in the quarter, even as its stock was tanking. Relative to its average share price over the period, it paid a 13% premium, the second highest premium paid by S&P 500 companies, after Symantec! Over the trailing 12 months, Apple blew nearly $40 billion on buybacks, and yet its stock dropped 15.5%. 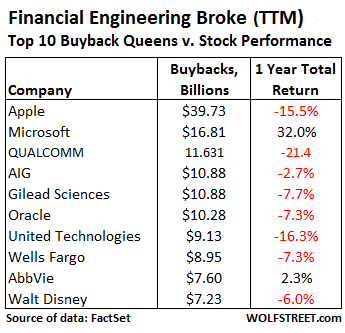 This table shows the top 10 buyback queens in order of the amount spent on a TTM basis, and the mostly dismal performance of their shares over the same period. In addition to the repurchase program, GE completed a stock swap with the former GE Capital retail finance division, Synchrony Financial, which had an effect on shares outstanding that was equivalent to a $20.4 billion buyback. As a result, the shares outstanding for GE were reduced by 6.7% in the last twelve months. The culprit? With income down over the TTM period, aggregate free cash flow has dropped 9.5% year-over-year. FactSet’s chart shows the declining net income (green bars), the nearly flat share-buybacks (blue bars), and the rising buyback-to-income ratio (red line, right scale). Note what happened last time income began to decline (2007) and share buybacks followed in 2008: the stock market crashed. And yet, despite the current heroic efforts to prop up their shares, companies have seen their shares get hammered. Clearly, financial engineering is kaput! Buybacks no longer function reliably in inflating stock prices. The opposite seems to be happening. Perhaps investors are finally starting to see through these shenanigans, and perhaps they’re now beginning to fret about all the debt these companies take on in order to fund buybacks! When companies borrow billions to then blow that moolah on buying their own shares that then promptly decline in value, it doesn’t create a loss on the income statement. Instead, those billions quietly go up in smoke. What’s left behind? Fewer shares outstanding, piles of additional debt, mauled cash balances, and much higher financial risk. But once companies see that share buybacks are becoming toxic as their shares decline despite buybacks, they curtail them. And last time this happened – in 2008 – it pulled the rug out from under the already teetering markets. “What do you think investors on Wall Street most underappreciate about Valeant?” a Morgan Stanley analyst asked Valeant’s CFO during the earnings call on eve of Valeant’s implosion. Read… Why the “Stubborn Persistence of Optimism” by Stock Analysts? ← Why the “Stubborn Persistence of Optimism” by Stock Analysts? I’m an engineer, not a financial analyst, so please help me here. Buybacks mathematically lower P/E because E per share increases; and if the stock falls per Wolf, a falling price will lower P and cause P/E to fall even more. And if there are fewer shares in the market, a given demand will find fewer shares and prices should go up. Looks to me like IN THE LONGER RUN, P/E lower, higher demand per share on the market = a good thing, not bad. What am I missing? Maybe I should have addressed this in the article, but I have written about it so many times that I didn’t want to sound like a broken record. The math you mention is the standard meme about buybacks that Wall Street wants you to believe. But buybacks are NOT free. They’re paid for with cash, and much of that cash is borrowed, leaving these companies burdened with debt they would not otherwise have. The proceeds from this debt has not been invested in productive activities (for example, building a new plant or developing a new product) that would help service and pay back this debt. Instead, it has been blown on a totally non-productive activity (buybacks) that will NEVER generate revenues or profits or cash flow for the company. One of the reasons why corporate investment has been so terrible during this “recovery” is that companies engaged in buybacks instead of investing that borrowed cash in productive activities. And that is a very bearish development long term. Doesn’t all that debt affect cash flow negatively since these companies have to pay back their loans (even if it’s only the interest)? Or are interest rates so low that the interest expense is minimal for now? If interest rates stay low long term, this game can go on for a long long time. Actually, it has been going on for a good while. Interest rates are low, but they’re not zero for corporates. Many of the corporations doing buybacks have a less than stellar credit rating. Even Apple, which has a stellar credit rating and balance sheet, is paying interest on those bonds it issued to buy back its shares, and that adds to its expenses and cash outflow for all times to come since it will likely just roll over those bonds when they mature, rather than paying them off. Apple is the best-case scenario. The worst case scenario is when a corporation suddenly cannot roll over its debt because it got in trouble and the interest it would have to pay has soared to 20% or so, and suddenly, that debt can push it into default. Isn’t buying stocks that way about emulating earnings from successful investments and writing off those ‘investments’ kicked down the road? Exactly. Stock buybacks are good for Corp. insiders mostly, but not many others. There’s a surge in stock prices for a time, but eventually mean reversion kicks in (read now). 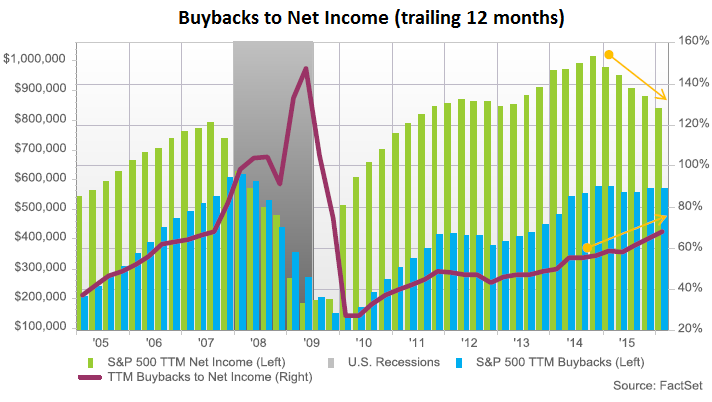 The money used for buybacks does not go for Cap. Ex./Plant Equipment/Expansion/etc. (i.e., productive debt) that would generate new jobs. This is also why worker productivity has been falling during the recent cyclical bull mkt. The Fed provided the punch bowl (cheap money at ultra-low interest rates) which lead to the enormous burden of unproductive debt and associated mal-investment of stock buybacks (among other mal-investments). More Keynesian folly. The piper will have to be paid. It looks like the current bear mkt. rally could be ending as soon as this week. CBs: Idiots and maladroits who never did any damned good for anyone except the crony capitalists. John Law lives on. One more time: this has NOTHING to do with Keynes, or what he proposed. I 2nd what Wolf said and add that at the same time companies go in debt to finance these stock buy backs, they also lay off workers to further fluff the stock price. The top executives and board are allowed to sell some of their shares at the jacked up prices and pocket the profits. This cycle repeats until the company is driven into the ground. Then the PR spin machine goes into high gear as the company’s demise is blamed on some other cause. After 2 bankruptcies and 6 CEOs, acquisitions and debt laden buy backs of stock, the previous owners of Hostess Twinkies ran their company into the ground, lining their pockets as they did so. And when the company finally cratered, they blamed it on the unions. I wonder if Disney has been buying back stock to compensate for the decline of ESPN ? VRX up 15% and near hod, great timing! Hope you cashed, because that company is going way of Dodo. Interesting dynamics with an eminent down turn in the markets coming during an election year when IMO much of the public really doesn’t like either of the Two Party candidate front runners. Every year things just get more and more *interesting*. I really wonder what the outcome will be. That old tongue and cheek rant about Pitch Forks and Torches in the streets? And most of the main stream media doesn’t seem to have a clue about anything. As if the dishonesty and crony capitalism doesn’t exist in their world. 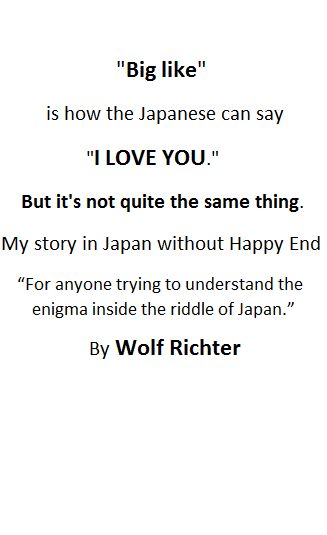 Thanks again Wolf for another very thoughtful piece that we would never read or hear about from the main stream. Those in the “KNOW” know! Insider selling has done nothing but increase in volume during this corporate borrow/spend buy-back binge. The corporate elites and their friends are ringing the cash register! Where to put all that extra liquidity, so that their ill-gotten moolah does not go up in inflation smoke? This partially explains the massive inflows into the gold ETF GLD and silver ETF SLV, along with the resilient rise of the two physical precious metals. So these must be the corporations that hiring no? I’d like to know more about the hiring, seems corporations are hiring or is that slight of hand as well? Why would they hire if the future was grim? Also, it’s true you have to be careful sometimes at the top insiders announce buybacks so they may offload their shares into strength. Sort of the same way as CHK’s Aubrey sold his art collection to CHK shareholders. Buybacks can also make sense if shares truly are under priced. You need to understand the particular circumstances, JPM bought back shares back in what, 1007 marking the top for instance. If a company is buying back shares using debt, they’re betting the farm sort to speak, management may or may not have skin in the game so investigate. Now, try to do this real DD in a foreign company such as China, good luck! I got it: always dig deeper! I enjoy your postings and have learned a lot (apparently not enough, though). But you should be happy, too, that you have to “re-plow” some old ground as it means you are getting new followers, such as me. I never skip your postings, as I do for many others! In short Share buybacks with Debt are a fraud on the common shareholder if there is not equal or greater Capital expenditure, or CapEx, which are funds used by a company to acquire or upgrade physical assets such as property, industrial buildings or equipment. .
SHARE BUY BACKS PROTECT THE BOND HOLDERS. Because like GM or say CELG there is often a bond provision where if the stock share price goes below a certain level, the Bonds convert to shares. When you have a share buyback with Debt, and no CapEx the only short term benefactor is the CEO and employees with employment contracts that award them with shares as part of compensation. Long term everyone loses — for one day they will sell/issue those shares back to the market to pay the debt, or obtain money for Cap Ex at a much lower price. Common shareholders are screwed. . Example GM. My broker pushed and pushed me to buy GM a few years ago at 32 and also bonds. I did not because I knew they were stuffing the inventory. I did not anticipate the amount of subprime lending to get rid of the inventory. Regardless, the stock has only maintained the 30’s because of share buybacks. The shif will hit the tan soon enough – I imagine GM at $ 18 will happen, with 90 % conviction rate. They will run out of buy back money and they will get stuck with inventory . Might be a good time to identify the companies who have grown the old fashioned way – INCREASED PRODUCTIVITY – and slide some money in their direction. I’m guessing there should be no more than about 2 dozen, and I’m an optimist. The stock market has punished those companies, and CEOs have gotten ripped apart over their refusal to play this game, including by “activist investors” such as Icahn. But I think there are a lot of smaller companies still out there that have been doing the right thing – as long as they can stay under the radar of “activist investors” and Wall-Street fee grabbers. If we are going into the stock buyback blackout period in front of earnings, shouldn’t we know almost exactly how far the stock market will fall in the next month? Is that amount of liquidity removed measurable? My tax return was made complicated because a former employer of mine, a distinctly minor league player, bought back shares from its former employees. It was going no where anyway, and yes it has gone down more since. but of course, it is just as true to say that they must do those things because they are all being driven from behind by those forces you mention. Now I’m struck with an image -The Karl Icahns of the world are like mule team drivers, and their 20 mule teams are top earning CEOs! I’d like to see charts that show the corporate stock buybacks on one side of the ledger and the individual insider stock sales on the other. This has got to be a systematic pump and dump scheme. How much of these buybacks are nothing more than buying back stock options that have been exercised by only management .Such buybacks do not decrease the number of shares outstanding and thus do not increase the earnings/share,but they do increase the debt on the balance sheet .It also tends to disguise the true compensation of managers. There have been a number of studies indicating that funds and individualss have been net sellers of stock during the last 5 years,while companies have been the primary net buyers. I’ve liquidated all my investments until I can figure out if there’s anybody out there I can trust among all the crooks. I like a company called arcadia biosciences (rkda). They have traits to make crop plants more resistant to drought and more efficient users of nitrogen fertilizer. They have huge partnerships with the major companies (they are trying to enter a monopolistic field). Perhaps that’s why they are so undervalued. Check out the article on them on SA. Agriculture is the one sector that won’t be allowed to contract when debt blows up. We all need to eat. I could see the coming world s financial misadventures lead to us using less copper, less gas. Even gold is just another financial asset, but land and farming are basic to our existence. A portion of every conservative portfolio should be dedicated to them. Arcadia Biosciences: frankenfood. No thanks. You can eat it if you like, but you might like to read the horror stories first. It would of course be unethical to impose it on the unsuspecting masses, but that’s never slowed down the rentier classes, has it? Human civilization still has terminators, clone wars, and Sun Lumien Khans in its future, any one of which quite guarantees you a truly surreal dystopia, assuming human civilization survives assorted other catastrophes, which is hardly likely and isn’t your problem anyway, focused as you are on short-term profits exclusively. Good analysis. Don’t forget that in the years 10-12 a lot of that income came from substituting higher interest rate debt for very low interest rate debt. That was the first part of the illusion, companies report increasing profitability and the news media attributed it to more efficient management, innovation and reductions in operating costs, when in fact none of that was true. I’ll say it again. All of this was planned action by the highest levels of our government and one of the key drivers behind QE and ZIRP. Our government believes that holding the stock market up is crucial. It has been systematically pumped up since 08/09. CEOs/CFOs were discreetly advised to buy up their companies shares with cheap debt to buy time for things to heal. Problem is, nothing has much healed. Remember though, the Fed has said (Bernanke) and will if necessary, directly buy equities if a crisis presents itself. The real question though is how long that could hold. It is not at all clear why either stock buy-backs or dividends are allowed using borrowed money. At the very least the interest should not be a tax deductible business expense, as this does not “grow” the aggregate economy. It should be noted that stock buy-backs are a form of tax evasion in that the “profit” is treated as capital gains rather than as ordinary income as dividends would be. Strongly agree with your general concept (I’d consider changing profit requirement to rolling 3-year). I’d also like to see shareholder vote required to authorize share buybacks (not just management decision). So if these corporations are all about rewarding insiders then where’s their incentive to hire employees, seems labor market has improved dramatically, no? There is no incentive to hire. My employer continues to layoff and outsource work to India. Morale and productivity is very low in the remaining staff. No one expects any positive news moving forward. Anyone know when we will reach the inflection point? Your company might be interested in hiring refugee immigrants, they tend to accept a lower pay scale. In the case of the Apple buyback, I always thought it was a way of repatriating cash trapped overseas. They borrow here and pay back overseas, allowing them to keep more of the American cash here. Depending on the tax situation and exchange rates, it could create loses in high tax countries and profits in low tax countries. Petunia, as the Senate investigation in 2013 found out, Apple’s “offshore” cash isn’t actually offshore. Just because the money flows into an account registered in Ireland doesn’t mean it stays there. It’s managed from the US, and it’s invested in global assets including US Treasuries and US corporate bonds, and all kinds of other US assets. That cash has found its way back into the US alright, untaxed of course. Interesting, repatriating cash also tends to drive up the currency. Thanks! You hafta admit, that’s one of my funnier typos. I’m nit-picking here, but it says “Four of the top 10 buyback queens were Information Technology: Apple, Microsoft, Oracle, and Visa”, but Visa is not in the top-10 table. Yes. But it’s not a mystery. “…Information Technology, with $33.2 billion in buybacks last quarter. Four of the top 10 buyback queens were Information Technology: Apple, Microsoft, Oracle, and Visa. But the table is about the “trailing twelve months” (TTM) and is clearly labeled “TTM”. Admittedly, I could have been a little clear, it seems. Yeah, these share buybacks will turn to dust in this on going stock market crash and destroy a lot of capital thus create a lot of deflation. I put this in the end of the first dent article, after SPX recovered from euro shooting overreaction. SPX is interesting right now. Run a tredline off those points which becomes resistance and SPX has just hit it and is running along it. It has broken dents curve. does it brake the trend/rsistance line or go back to test support below 1800.